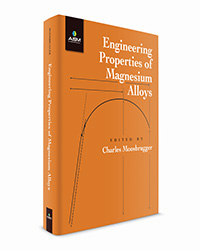 "Engineering Properties of Magnesium Alloys," edited by Charles Moosbrugger, was developed to be a valuable reference for engineers, scientists, teachers, and students engaged in the design process of material selection and elimination. A large part of "Engineering Properties of Magnesium Alloys" is devoted to datasheets for individual alloys that provide a handy and quick reference to specific properties and performance. Magnesium and magnesium alloys provide unique properties for engineering applications. Magnesium alloys are popular as a structural material because of their combination of light weight and strength. They are desirable for portable tools, appliances, electronic devices, airplanes, space vehicles, and land transportation. "Engineering Properties of Magnesium Alloys" focuses on the effects of various processing paths leading to the desired component geometry as they affect the properties and usefulness of the finished component. While focused on mechanical properties for structural design, the physical properties that are germane to corrosion behavior and electrical applications are also represented. A large part of "Engineering Properties of Magnesium Alloys" is devoted to datasheets for individual alloys that provide a handy and quick reference to specific properties and performance. The book also addresses topics common to all magnesium alloys such as the alloy designation system and product forms. Casting alloys and wrought alloys are compared and fatigue properties and performance at elevated temperatures are presented. Finally, a summary of the corrosion behavior of selected alloys is discussed along with how these corrosion mechanisms can be applied for beneficial results. "Engineering Properties of Magnesium Alloys" ($199.00, $149.00 ASM Members, 184 pages, hardcover ISBN: 978-1-62708-143-6, eBook EISBN: 978-1-62708-144-2) is available at http://www.asminternational.org/propertiesofmg or by calling the ASM International Service Center at 800.336.5152. "Engineering Properties of Magnesium Alloys" Guides Materials Selection— ASM International publishes resource focused on processing paths, properties, and usefulnessEngineering Properties of Magnesium Alloys, edited by Charles Moosbrugger, was developed to be a valuable reference for engineers, scientists, teachers, and students engaged in the design process of material selection and elimination.